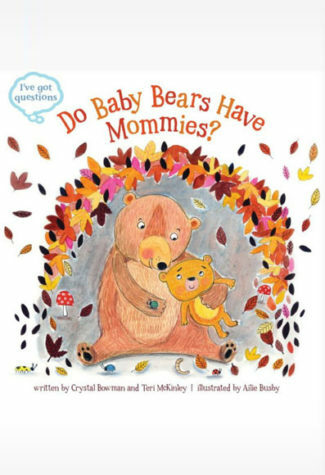 HomeBooksDo Baby Bears Have Mommies? Home / Books / Do Baby Bears Have Mommies? Crystal Bowman and Teri McKinley team up again for the “I’ve Got Questions” Series. Kids ask a lot of questions. Some silly and some innocent. Some deep and some serious. The books in the I’ve Got Questions series address many of those childlike questions and offer satisfying answers. The content is lively and fun, yet meaningful and respectful of a child’s inquisitive mind. While the books have a strong educational component, the deeper purpose is to show parents how they can respond to their child’s questions with patience and love. Illustrations feature multicultural characters both male and female. Do Baby Bears Have Mommies? answers questions about animals. Children learn about starfish, elephants, bears, stars, earthworms, eagles, trees, and heaven, while absorbing the underlying themes of God’s love and grace and a parent’s love for a child.